Today's tale is called "Poison Ivy." One time while camping my brother set up his tent in bare feet. His feet became horribly covered in poison ivy. They began to blister and ooze after awhile. It was horrible. Will this story be scarier than my brothers affliction? I doubt it, but let's see. Much like the first stories in More Tales to Give You Goosebumps this story takes place at sleep away camp. Matt gets sent there, much to his dislike. These kids NEVER like being sent to camp. Did everyone hate summer camp growing up? So camp may not be totally great but it wasn't totally horrible... at first. At night Matt hears strange scratching sounds. While checking up on them he sees the patch of poison ivy... moving around. It has long tendrils and he barely escapes. Naturally none of the guys believe him. In the morning though, the whole baseball field is completely covered in poison ivy. Half the kids in camp have itchy rashes by the afternoon! Counsellors armed with weed wackers and weed killer go off to deal with it never to be heard from again. The next night, things got even worse. The poison ivy spread to cover their cabins. The weed is alive and scratching at their door. It seems like there is no escape but something makes the killer plant retreat a little. It's Matt's annoying bunk mate aftershave! The plant must hate the smell! I didn't know plants could smell... but then I also didn't know plants could move around like that. Thankfully the preppy kid brought 12 cans of the stuff. They slowly and efficiently make the poison ivy retreat from camp and corner it to the lake. With it gone, finally they can go back to trying to have some fun at camp again. It would be easier to have fun if there wasn't a swirling black cloud coming there way. What could it be? Oh that's right... preppy kid's aftershave attracts mosquitoes. Growing up I never really remember getting poison ivy rashes. I may have once, but if so it was mild. I also never went to summer camp though I did go for occasional overnight or weekend camping with my family in a tent. Despite not having strong memories of the consequences of poison ivy, I do remember being worried about the potential. I don't think I could have successfully identified the plant, but it was a fear of getting it while out in the wilderness. In fact I seem to remember having arguments about a plant being or not being poison ivy with my friends. I am not sure what the argument really achieved since we were not about to touch the plant either way. Oh well. So, as a story that kids can kind of relate to, I think this sort of works. Kids have probably been warned about poison ivy. They may have dealt with it first hand. Or they may have been warned about it and then gone off to camp for the first time and have lingering worries. That is the thing though, they are more worries than FEARS. It is kind of hard to be scared of poison ivy to the degree this story wants you to. The imagination struggles to think of it doing anything worse than giving you a rash, even if it spreads very quickly. Yes it is said that two camp counselors disappear while dealing with it but we don't really know how. What did the plant do to them exactly? Tear them limb from limb? Why? Eat them? How? it's not a venus fly trap. Did it just grow around them and suffocate them? Maybe. Perhaps children with more active imaginations can think up horrible things for the plant to do to them much better than adult me. As it stands, I am going to have to consider this story more as a "goofy" one that a frightening one. 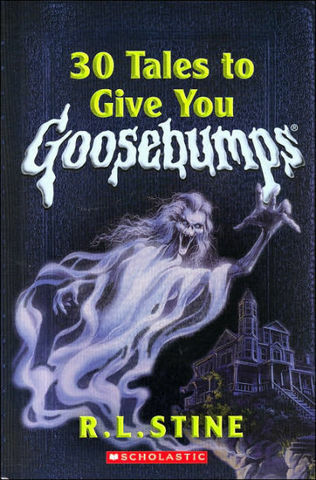 And yes, Goosebumps is usually pretty goofy too, but at its best it can still deliver a fright. While it is silly, I wouldn't classify it as funny. I guess "fun" would be an ok descriptor. While I wouldn't consider this the definitive "camp story," I think it would be an enjoyable read for kids at camp. Or it could even be a fun one to read to your kids BEFORE they go to camp. Might just give them a little something to worry about. Maybe. Tomorrow is the final book of More Tales to Give You Goosebumps and it is called "The Spirit of the Harvest Moon" I assume it is about a literal spirit. Could be fun. It also seems to bring a close to the summer theme of this book. After that we will begin the final portion of the reviews for the book Even More Tales to Give You Goosebumps. Should be fun!